Community organisations will play a bigger role in helping workers improve themselves, as part of efforts to address the mismatch in skills between job seekers and available vacancies. Acting Minister for Education (Higher Education and Skills) Ong Ye Kung yesterday announced a new programme called SkillsFuture Engage, which will complement existing skills upgrading and training efforts. Under the programme, community development councils (CDCs) and self-help groups such as the Chinese Development Assistance Council (CDAC), Mendaki, Sinda and the Eurasian Association will "engage more members of the public and guide them in navigating our training and education landscape", he said. "(With the SkillsFuture credit, people are asking) what training should I go for? And that is really the ground request that we are getting today. 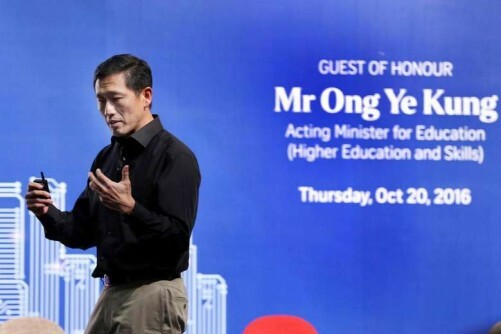 People need some guidance to navigate this very complex training and education landscape," added Mr Ong, who was speaking at The Straits Times Future Economy Forum at the Singapore University of Technology and Design yesterday. SkillsFuture - which encourages workers to update their skills to thrive in the workplace - includes a plethora of initiatives, such as a $500 credit to pay for skills courses for Singaporeans aged 25 and older, and the Earn and Learn scheme for fresh polytechnic and Institute of Technical Education (ITE) graduates to work and gain qualifications at the same time. Some self-help groups have already started reaching out to help communities with skills upgrading and training, Mr Ong noted. For instance, Mendaki has worked with some ITE colleges to set up Youth Space@ITE to help students with their careers and support their progression into the workforce. The CDAC used to have a committee which looked after workers' skills upgrading - which Mr Ong chaired - but this was eventually merged with the organisation's family committee, to avoid duplication of the Government's efforts. As a result, the family committee has more resources to reach out to the public and offer residents career guidance. "We need to do a lot more of those ground efforts," he added. "SkillsFuture Engage will reconfigure the current system of engagement so that we have more effective labour market intermediaries. "Over time, we can even consider bringing in private sector companies and other intermediaries that can strengthen this system."